It was field trip day with my preschooler, JarBear. I am one of those horrible moms that don't love field trips. I send them to school for many reasons and my sanity is the top of that list. And since my kids are in private school I pay for that sanity. With my older kids I always had the excuse of have little ones at home, but now my excuses have run dry. My kid loves it when I go. And as I discovered today, it's so he can get in more time to hang on me and whine. Yea, that's fun. I noticed as we arrived at the Natural History museum, that a mom was toting cupcakes share for her daughter's birthday. Okay, that could be some motivation to get me through the museum with 20, three to five year olds. As we were guided by our 90 year old docent who actually wanted the kids to be quiet and listen, my mind kept wandering to the cupcakes. JarBear enjoyed the museum and we both tolerated the smell of old, dead, dusty animal fur. "Mommy it smells funny and hurts my eyes." (we are still working on differentiating our five senses). JarBear finding Nemo from the inside out. 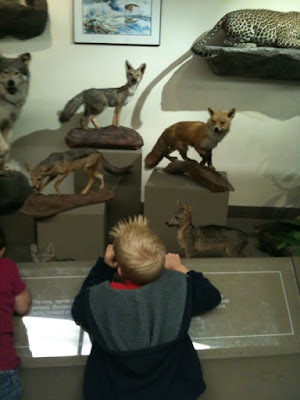 Looking at old, dead, stinky fur animals. After 1 1/2 hours of enlightenment we walked to the adjacent park. Cupcake time! 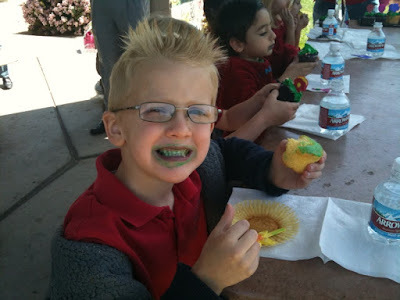 The kids were sitting at two different picnic tables where cupcakes were handed out along with napkins and water. All of the kids were served and there were almost a dozen leftover. There they sat and not one mom partook. Seriously? You can't tell me I am the only one who wanted a cupcake. It was 11:00 am and I was starving. If I had been home I would have been on snack #4 by now. All the mom's stood around and pretended to enjoy watching their kids devour their treats. JarBear was licking his like a lollipop. I wandered nonchalantly to the end of the table with the leftover cupcakes. I just knew any second there would be a mad dash for them and I wanted to be the first one in line. The mom who brought the cupcakes started gathering them up in a box. Really? Are we all pretending to be on diets? I heard her say something about saving them for the afternoon class. My stomach was growling and I was denied a cupcake. I blame her for my stop at the Sonic drive-thru window on the way home. I blame her for the mouthfuls of frozen cookie dough since I've been home. This could have all been easily avoided with one cupcake. JarBear enjoying his cupcake. Whatever. I would have stolen your son's. I am serious about cupcakes. Dang Kristina is FAST. My kids are even at recess and thought I'd be the first comment. Field trips are the worst for teachers too. I can't stand them. I dread ever second of them. I am always scared I will lose a kid. As for the cupcakes... I would have just went and got one out of the box. The nerve, who does she think she is anyway, the cupcake nazi! 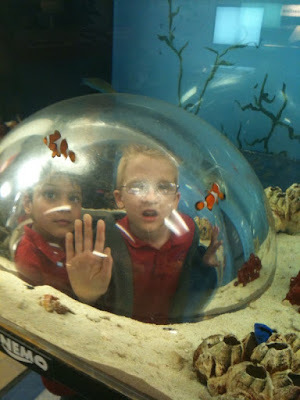 We quite doing field trips with the preschoolers years ago. I seriously don't know what we were thinking back then, I guess we were younger. I. Hate. Field trips. with. small. children. They are evil and designed to torture mothers. And I'm with everyone else who commented, I totally would have stolen a cupcake! You were starving, and had every right to that delicious confection! I would've just helped myself to a cupcake along with my kid. Oh? They weren't for the adults? My bad. Too bad I already took a bite! Haha. I would have swiped my kid's until he licked it. Dang cupcake lickers. Sorry about the cupcake Linda. If I would have been there I would have gotten one for you. I don't really like them. But, I wouldn't have been there because I hate fieldtrips. I have to go on one in June with all the 2nd grade classes at my school. I hate when the other mom's won't eat and pretend to be above the kids' snacks. Not me! If it is there, I want some. And now I can blame you for my craving for Sonic. Hahaha! Yes, I'm all about the blame...:) Great blog Linda! Ok, really. Oh my hell, we are twins. One of the reasons I kept having children was so I could keep the tradition alive of having an excuse to not be the field trip mother. And my daughter turns into an idiot that I find myself embarrassed to be associated with when I am suckered into attending. And what the crap is up with that whole, "Oh, no. No, couldn't POSSIBLY eat a WHOLE CUPCAKE. I'll just watch and sip my STUPID A WATER." If I'd been there with you, I'd have raced you to the pile and have one shoved in my mouth hole before you could blink. All I can think of is me mumbling under my breath as the mean lady took away the cupcakes, "I didn't want your nasty dried up cupcakes anyway!" Followed up with me sticking my tongue out at her. See the truth is, she is going to go home and eat them all, and then tell the fam that they all got eaten up by the kids. And, yeah, I so would have eaten one. I love cupcakes! Seriously, seriously funny! Totally following you. Hey - can't say I didn't warn you, right??? What the heck is up with you people? At the risk of being gossiped about for the next several weeks, "May I have a cupcake please?" would have been pouring out of my mouth quicker than you could say "old dirty stuffed animals" LOL - too funny! I used to hate field trips when my daughter was little. But I went anyway. Yours looks like "funny". Your blog is great. You've never really experienced a great field trip until you've gone to Disney World with a busload of 1st graders! The husband and I always got the ones on meds...hours and hours and hours of walking with 6 hyper kids! The joys of being a school volunteer. Shoot - I would have mowed those other moms down, just for a chance at a cupcake. Field trips are so exhausting on us mamas! Yeah, that mom seriously has a lot to answer for. What kind of a monster doesn't even offer? Besides that the mom's who DON'T eat cupcakes would be much happier if someone offered so they could refuse. I am so angry on your behalf! Shift Work Disorder, a.k.a., MOTHERHOOD! Dear Oprah, I am over you. Life is good then you get pooped on.